How tall is the console table? - Could you please tell me how tall the console table is? What color stain are the floors? where did you purchase the console? What color and type of flooring? I'd love to know the stain color too! I assume the flooring is red or white oak? Love the wall color! Does anyone know what it is? would this staircase be difficult for my contractor to build in a new house? Who makes this console table and what is the name of the line called? - Dimensions would also be appreciated. Thanks for the reference, Brian! 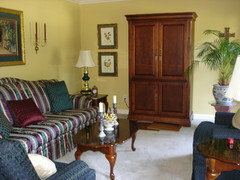 At Weego Home, we also work with clients to customize any of our designs, including size, finish, and hardware. I am very impressed with your willingness to share the info on the products you use in your designs. The design is beautiful! Great space! What is the ceiling height here? what is the color of the stain on the treads and handrail? can you let me know what company you bought the stairs from? Do you have the color of the stain? Is it walnut? Been thinking about painting our stair treads and hand rail black also. Does it wear well?? What type of flooring should I consider? - Hi....My house is 20 yrs. old and the style is a Traditional/Colonial two story. I'm replacing the carpet in the formal living/dining room and stairs. I'm having a hard time deciding on the type of hardwood I want. The 5" handscraped plank (hickory) or 3" Bellawood smooth, semi-gloss floors (oak) My home has a concrete slab so Engineered hardwood is what I'm considering. It has 8' ceilings and a foyer in the center, then living room on right and dining room on left, with stairs off centered from front door. I have ceramic tile in the foyer all the way into the kitchen and eating area. It is 8" tile so considering 18x18 (less grout). Your professional opinion is sincerely appreciated. Thank you for your reply. 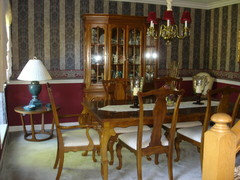 I have attached pictures of the rooms. Would you use a 3" or 5" oak floor such as Anderson, Lincoln Plank, Spice color? I would highly recommend 3" flooring stained english chestnut, satin finish. Where can I find the lamps? I really like this console table! Does anyone know where I could find it? Thank you! The Bungalow 5 piece is very cool. I like that the one pictured has just a hint of modern detail though - fits more with the style of my house. Any other suggestions? Hi @amy_p, the designer of this space came in and correctly sourced this product. Anyways, here's the link to buy for you. Can you give me the type of flooring (manufacturer, size of boards, color)? Please! I would like to know too. Me too the floor is awesome! what is the name of the grey wall color, I love it! Stair railing - Was wondering if anyone could give me a ballpark figure of how much a new stair railing like that would cost? We provide free estimates. I do not think it is appropriate to post our pricing on someone elses work. I am sure you could contact Brian as he has a website listed or if he does not respond you can contact me and I will try to answer any questions you have. What color is the stain on the steps? What is the height of the table? Thanks so much! I was looking at one for my foyer that is 30", maybe it is too short?? Where can I get the console table? I just tagged the photo with the exact model credenza — just click on More Info and a green product tag with the information and website link will pop up. anyone know where the rug is from? Just saw this rug at Horchow.com. It is the "sunset" rug. 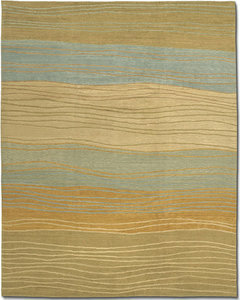 This rug is from Tufenkian Carpets, Tides Meadowbrook. What's the finish and stain color of the wood floors? They look like site finished Oak floors. The stain looks similar to Jacobean. posts - Can you buy the spindles like this or do you have to buy wood and cut them square like that? Could you tell me the height of the end stair post from the floor? - I am building a house with the exact same look and our post looks too high but it has to be in order for the top railing to be at 34" and pass code but the floors aren't in yet so that will help too. I need some reassurance please. We have the same look --square posts dark floors but we have l rubbed bronze pickets. Thank you very much! Area rug - Where did you get this beautiful area rug! Stairs - Could you please tell me the tread, baluster and newell post sizes? Yes, i'd love to know the newell post size, too. The entryway looks nice and open. Do you know the width of the staircase and the hallway? hi coould you let me know what the colours are you have used on the walls. I love the space you have created . - I love this space and i would like to copy it in my home. many thanks for your time. Where can I find console table and stools? Love the floor color, can you please tell me the stain color? I assume these are red oak floors? A similar stain to look at is Walnut Wainscot 3120-P by Sherwin Williams. Hi, is this handrail stained dark or is it painted ? I feel that it's stained. As you look up the rail, can you see some color variations? It's such a great look. the painted lady - what color white is used on the walls? Beautiful handrail - Where did you get the wooden handrail? What is the style or number? Thanks. What size square spindles? - Are the square spindles 1 1/4" or 1 1/2" or 1 3/4"? Beautiful! Do you want size of spindles and newel post on landing? Beautiful entryway! What is the name of the rug and where is it from? Horse - Curious where you can find the horse sculpture? Spindles - That paint colour are the spindles? Do they match the wall trim? Who makes the consule table - Who makes the table?? Joel - How high is the ceiling? Stools - Who is the manufacturer of the green stools? Trim - Hi, could you tell me the trim color please? Thanks!! Sbaillon - I would like to know where I could find the shell lamps? Horse - Love the horse statue, where is it from? Love the wall colour - what brand and colour is it? Sb - Where can I find the lamps? Living room ideas - I have 3 couches and 1 chair in my living room and i need to add my Christmas tree how do I set it up ? I love the door, it it custom? can you tell me the manufacturer? love floor coloring. - what is the stain name and what kind of floors are these. Cool closet - How can I make a cool hang out in. What color/brand flooring is this? Also, what stain was used for handrail? what type of header is used above the entrance way? what is the height of the wainscoting . What type of floors are these? Oak, brazilian or other? And what color finish? Hi there! We love the look of this stairwell and showed our designer this picture while we are working on building a house. Is it possible to see how the exterior of this house looks to get a better idea of the placement of the stairs? Is there a rule of proportion with Newell posts? Should the thicker base be a certain height proportion to the main body? Thank you very much! I learned from my mom that black and white always works, period. Whether in fashion or interiors, whether it's a traditional or modern space, there's nothing like a black and white palette that says timeless. Black can add a bit of edginess to any room and help a room from becoming too sweet. No matter how traditional, any piece of furniture painted black is transformed instantly and can work in just about any space. I apply the same concept to architectural details such as your stairs. The graphic quality of black and white can make a space more conducive to incorporating modern furnishings and bright colors into the mix. Gold nautilus shells go from campy to sophisticated in this elegant entryway. 2. Foyer console. Paint a console from your local thrift store, and you have a catchall for all your keys, mail and cell phones as soon as you enter the house. Add a couple of dashing table lamps to finish the look. So many old homes have beautiful wood staircases that should be shown off. I love how the two lamps brighten this entryway and show off this incredible banister and stairs. Instead of saturating the area with color, the upholstered green ottomans provide a touch of green and soften what might have felt like an otherwise stark space.